The Frio retro is a throwback to coolers of days past. Holds 18 cans or 12 bottles w/plenty of ice. Includes stainless steel body, bottle opener, & easy flip handle that locks the lid in place. 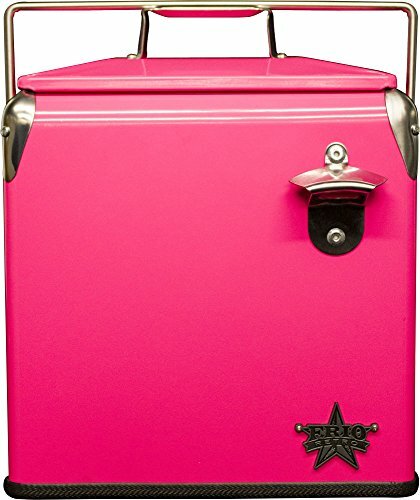 The retro steel coolers are more of a nostalgic item that is meant for 1 day event or special occasion. This item is more for the look than performance, however it does just fine for a 1 day event or evening party. Our soft side coolers and roto mold coolers are ideal for your 4-5 day ice retention requirements. The cups that are included in the current special package are excellent quality, vacuum sealed double wall with copper lining and bottle opener on bottom. The cups keep ice for up to 24 hours and keep hot liquid up to 12 hours.